The Twisted Roots Pose is an intensely therapeutic pose that massages your internal organs and lights the fire in the core of your being. It is a variation on the Lying Spinal Twist Pose, and works more deeply into the mechanism of the twist. For a review of the easier Lying Spinal Twist and it's benefits, click here. The twists are all stabilizing and energizing poses, yet when done on the floor, they feel amazingly supported as well. I love to do the lying twists in the early morning before my feet even hit the floor. It is part of my bed yoga routine, which I do most days! The lying twists are always included to release the spine, nourish the internal organs and help you wind down at the end of the day, or energize the beginning of your day. This Twisted Roots Pose, is my absolute favorite pose and if I am practicing yoga, I always include this one! I absolutely adore how this pose makes me feel and how it opens me up into my own personal depths. This pose, begins with you lying on your back with your knees up and your feet flat. Take your right leg and cross it over the left, continuing to twist your right foot under your left ankle, like the leg position in the Eagle Pose. Please refer to the first photo, of the starting position, below. When your legs are locked around one another, begin to center yourself and start breathing deeply, down and into the belly. 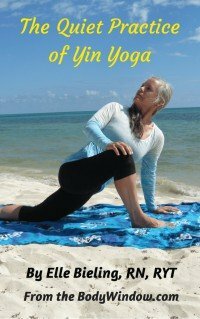 The art of belly breathing is a technique that will deepen your experience of this pose, so if you need a refresher, please click on the link. If anything feels constricted at this point, you are not quite ready for this pose yet, but return to the standard Lying Spinal Twist. Intend to try it another day, and one day you will do it! When you have sent deep relaxing energy into your hips, legs and belly, allow your eagle legs to fall to the left as you enter into the twist. You should feel a deep pull in your right hip, lower back and side. Keep your head in neutral and assess your body here. Your shoulders should be on the ground. The tendency is to place all your effort on getting your knees to touch the ground and often in this effort, your right shoulder will pop up. If you cannot keep both shoulders grounded, you need to return to the standard lying spinal twist, without crossing your legs. If this feels OK enough to remain, meaning that your shoulders are grounded, you are able to continue with deep breaths into your belly, and you feel like you can stay in this pose for several minutes, continue holding this deep twist. If you find that you are holding your breath, or the edge is too intense to hold for much longer, untwist your legs and return to the standard Lying Spinal Twist. Continue to release your spine and place your left hand on your right knee, to help send energy into the twist through the weight of your hand. Bring your right arm up over your head, as shown below. If you still have more room, or have created more as you held the pose (your second edge), you may go ahead and turn your head in the opposite direction, to the right. This will add a neck stretch to the pose as well. Continue to hold this pose as you breathe deeply into the areas that are tugging, inviting more opening into the center of your being. When you have held the pose for 3-5 minutes or more, use the counter pose of the Knees into the Chest Pose, for a minute, before repeating the twist on the opposite side. The spinal twists revitalize and energize your core. This is done by the squeezing of the internal organs as you hold the pose, and then the release with the resulting rush of blood into your core, providing the new blood, energy and "fire into the belly." The Twisted Roots Pose is a sure-fire way to open the energy flows of your 3rd Chakra, that part of you that honors yourself and brings you personal strength. If you return to the quote above, as the Christian mystic, Thomas Merton says, we can "open the door in the center of our being." I believe this pose can aid you in that process. If you approach your Yin Yoga practice in a meditative fashion, and contemplate the meaning of opening and energizing your 3rd Chakra, indeed, you can fall into the immense depths that are infinite, yet totally accessible to you. May you find the depth of the Twisted Roots Pose to aid you in your self-discovery, that you may honor and love yourself more, bring new energy and personal strength into the very core of your being. May you light that internal fire, to fulfill your own Sacred Purpose in your life!